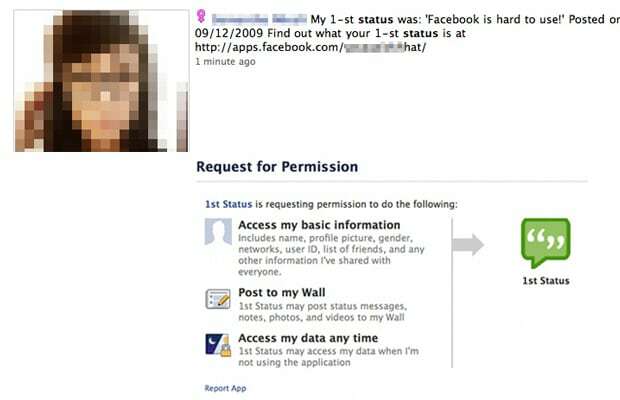 Preying on the nosy nature of Facebook users, this scam tricks people into believe that they could see their friends first-ever status update. Spam experts immediately noticed a couple of red flags with the service that was growing in popularity. They saw that most user updates were uniformly made and that the dates were either fake (i.e. 10/97/2009), or, even more deceiving, a user's sign-up date. They also found that the URLs were shortened using a service like Bit.ly or TinyURL, and led to a Facebook application scam.